All too often during poor economic times many debunked economic fallacies of the past get reinvented. The reason is simple: a search for ideas and solutions alternative to the "mainstream" (however we define it) allows those who succumb to these fallacies to repeat the ancient errors classical economics was hoping to get rid of. The short-termism of politics plays a crucial role in the process of persistent perpetuation of such fallacies. This is why in times like these it is essential to go back in economic history and debunk some of the ideas that tend to surface repeatedly. In the following couple of posts, I attempt to do just that. One of the most misunderstood areas of economics is international trade. More precisely, the idea that if we were to boost net exports - by subsidizing exports and constraining imports - we can achieve higher GDP growth. If one looks at the simple arithmetic of a standard Keynesian macro model: Y=C+I+G+NX, then it's pretty obvious - boosting net exports will indeed result in higher Y (output). However, the question is how does one properly boost exports? Higher exports come as a consequence of higher domestic production. The direction of causality is pretty clear in this case. We first need higher demand and stronger productive activities (usually encouraged by a set of supply-side reforms), and we need to operate in a competitive market economy which will generate economic winners who will be able to compete with their products globally. The crucial point is for the market, not the government, to generate winners. So boosting exports is a process that starts with a stronger productive base and rests upon domestic competition. When a politician says "we need to double our exports" what he should be thinking is that we need more competition and a more favourable business environment to boost domestic production. However, what he actually means is: "we'll flush money down to the exporters, heavily subsidizing them until they fulfill this goal". But they never do. To understand why, let's first take a trip back in time. At the heart of mercantilism is the view that maximising net exports is the best route to national prosperity. Boiled to its essence mercantilism is “bullionism”: the idea that the only true measure of a country’s wealth and success was the amount of gold that it had. If one country had more gold than another, it was necessarily better off. This idea had important consequences for economic policy. The best way of ensuring a country’s prosperity was to make few imports and many exports, thereby generating a net inflow of foreign exchange and maximising the country’s gold stocks. It was the dominant economic doctrine for more than three centuries (16th - 18th), mostly associated with the colonization era. It was often dubbed economic nationalism where the efforts to boost exports were backed by a powerful state protecting domestic monopolies (such as the British East India Company). It was a way nation-states were competing with each other. The nation which had more gold (=wealth) could raise a stronger army, and thus be more powerful. The role of colonies was crucial in this power struggle, as they were the source of precious metals and raw materials, and on the other hand the recipients of exported goods. 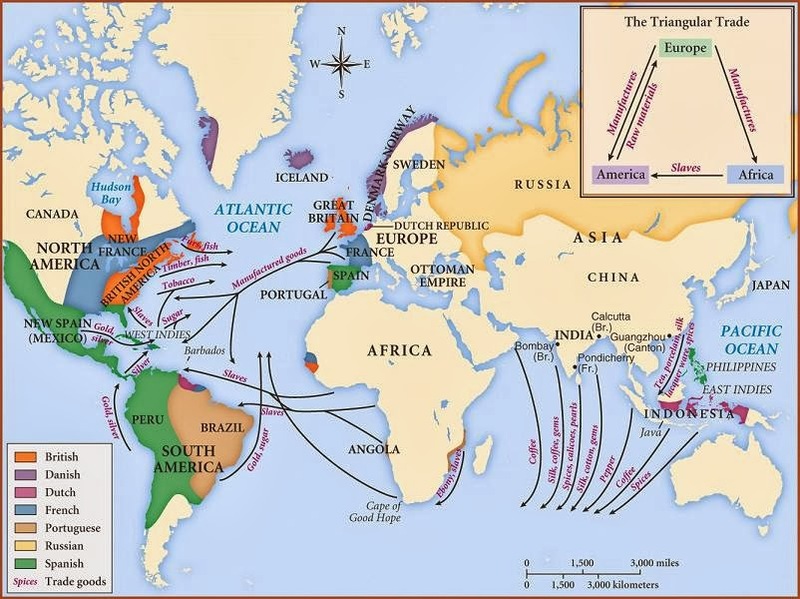 Mercantilism was characterized by a triangular trade system, where European countries were exporting manufacturing goods and textiles to Africa and America, America was sending raw materials to Europe, while Africa was "sending" slaves to America (see map below). It is in fact upon this system that many see the origins of the Great Divergence. However, as denounced in the previous post, the Great Divergence started after the Industrial Revolution and its causes were completely different and much more complex to be resorted to pure colonialism. After all, during the period of mercantilist dominance, the living standards of the population were still miserable, not much better than during the hunter-gatherer times. A big part of the mercantilist doctrine was protectionism. More precisely protectionism of business interests against any forms of competition. Governments applied many forms of different protectionist policies, from guild rules and taxes, tariffs and quotas, prohibitions of imports to big state-run monopolies. It provided capital to exporting industries and even prohibited exports of tools (technology) and skilled labour that would allow foreigners to produce the same goods the home country is producing. 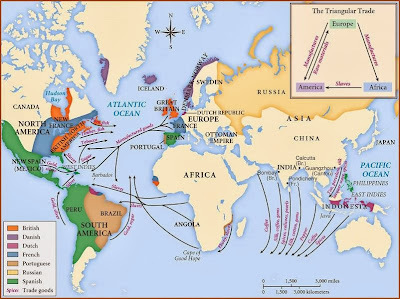 In shipping for example the rules were even more absurd, where according to the famous British Navigation Act of 1651 all imports to England had to be carried on an English ship, while colonial exports to Europe had to first land to an English port before going further. The collapse of the doctrine itself can be attributed to Adam Smith's classic "The Wealth of Nations" in 1776. Smith's argument was that the wealth of a nation consisted not in the amount of gold or silver stashed in its treasuries, but in the productivity of its workforce. He clearly showed that trade can be mutually beneficial, an argument also made later by Ricardo and his law of comparative advantage which states that countries specialize in the production of those goods which they can produce relatively more efficiently than any other country. Smith's second crucial point was that specialization in production creates economies of scale which affects both efficiency and growth. Specialization was the key reasoning behind the Industrial Revolution itself. Smith also argued against the harmful relationship between government and big industry. With policies such as these the only beneficiaries were the ruling elites and the big merchants. As a direct consequence inequality was extreme, which is why the living standards of the general population were terrible. Gradually, as the Industrial Revolution was looming based on the principles of laissez-faire economics, the mercantilist doctrine was slowly becoming obsolete. It took a lot of time before the benefits of the Revolution reached the general population, but this was the only shot societies had to achieve prosperity. Mercantilism was never the answer. The protectionist argument opposing free trade, both today and during mercanitlist times, rests on the assumption of protecting domestic jobs. This is completely wrong. In the long run, in today's globalized world no one can protect the declining industries from going under. Giving them protection and thus disabling them from adapting to the new market conditions only makes it even worse for them in the end. This is why government-protected companies never succeed in being globally competitive. They become overly dependent on government protection knowing there is a safety net below them, meaning that they never achieve their full market potential. Which is a shame. Smith, A. (1776) ‘Of Restraints upon the Importation from foreign Countries of such Goods as can be produced at Home’ An Inquiry Into the Nature and Causes of the Wealth of Nations, [Book IV, part ii, chapter II]. Available here. [Smith’s discussion of the Navigation Acts]. Braudel, F. (1983) Civilization and Capitalism, 15th-18th century: The Wheels of Commerce (vol.2) Harper & Row. Schumpeter, J. (1954) History of Economic Analysis. Oxford University Press. Chapter 7. John, I don't think it was the same merchants that had monopoly power that decided to take down the Crown. After all, they were enjoying their position very much and had no reason to change it. It was the spontaneous rise of many other merchants and manufacturers that were getting fed up with how the state was disenfranchising them. Vuk, thanks - a really interesting article and a much-needed debunking of mercantilism. Funny how when times are hard everyone reverts to the mistaken beliefs of the past. Great references too. Thanks. Yes, I've been hearing people calling upon these solutions much too often, so I decided to react. Much of Mercantilism seems to focus on tariffs on imports. How about encouraging exports? Does this count as Mercantilism? I ask because if a country has a rate of tax on imports and exports which is equal. If they were to then reduce the tax on exports in order to encourage exports but not on imports they would be in affect creating a higher tariff on imports. I for one would like to see free trade for both imports and exports but if you cannot have that would a lower tax on exports be better than nothing? You're correct, in the theoretical example a lower tax on exports would be better, even though this certainly isn't the best alternative. However, I've never heard of a country that has taxes on exports. On the other hand imports usually aren't taxed, but tariffed. A tax comes later in form of value added tax for example. Countries go to lengths to protect their domestic industry by forming all sorts of constrains on imports. But in the end this doesn't actually help the country. Exports on the other hand are best perpetuated by having strong domestic production. The statistical analysis services are best to get logical facts about different analysis. In economically speaking it is best job.